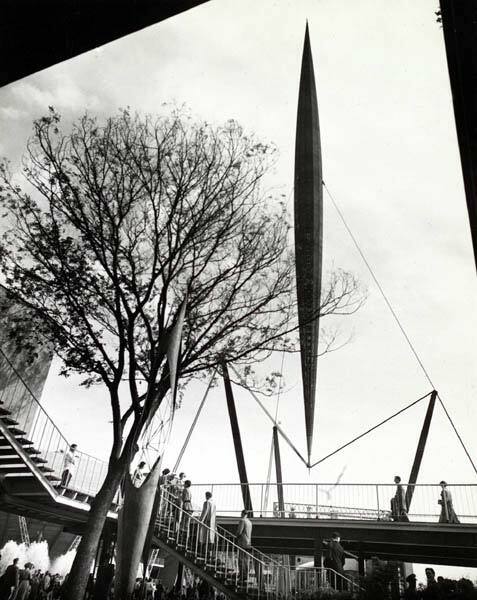 Skylon, 1951, Festival of Britain. Image in public domain." Located between Westminster Bridge and Hungerford Bridge, it consisted of a steel latticework frame, pointed at both ends and supported on cables slung between three steel beams. It was 300 foot high, cigar-shaped, aluminium-clad, suspended almost invisibly by three cables, that made it seem to float 40 feet above the ground. The partially constructed Skylon was rigged vertically, then was hoisted higher when deployed. Jáuregui quotes Cruickshank: “By an amazing stroke of genius [Felix Samuely]] arranged a system of hydraulic jacks underneath the three smaller pylons. Once the whole structure was assembled, he pumped up these jacks and raised the pylons. This put tension or stresses into all the cables and by doing that the whole thing became a stressed structure. This reduced the number of wires needed to anchor the Skylon and halved the amount of oscillation in the structure." 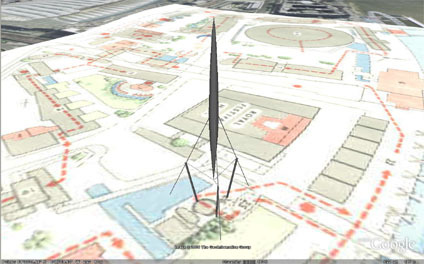 Skylon schematic uploaded to Google Earth"
This page was last edited on 18 January 2019, at 09:46.